Follow Start > All Programs > DVDVideoSoft > Programs > Free YouTube to DVD Converter or click the DVDVideoSoft Free Studio icon on the desktop. The interface is self-explaining. 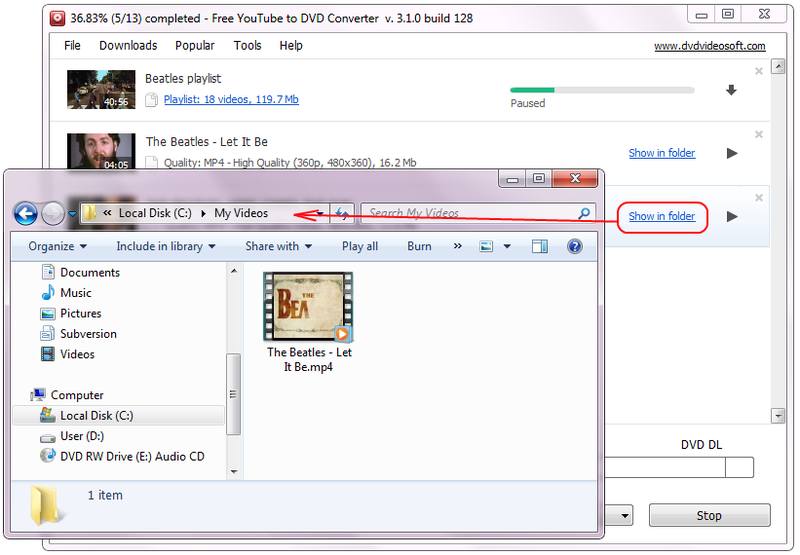 There is a field for YouTube links, a field for output settings and the Create DVD button. In the list of Presets select DVD NTSC or DVD PAL. Select available pre-configured quality settings. 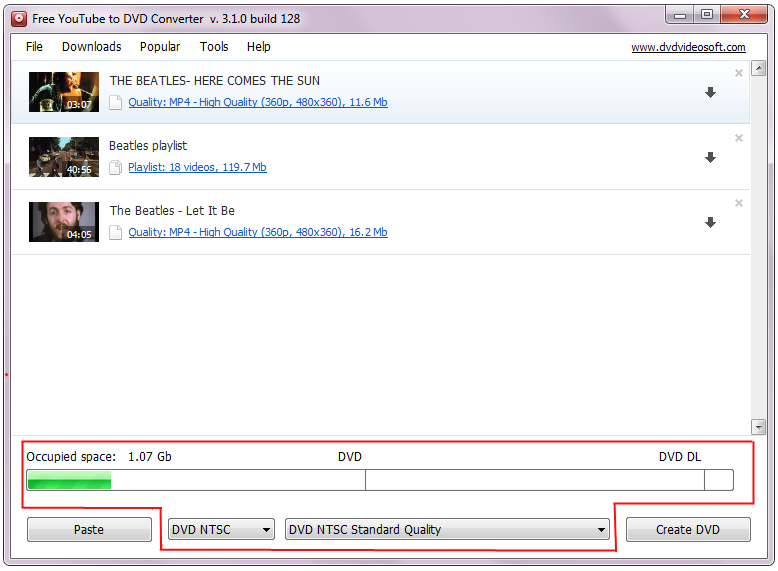 The size bar below indicates the space which your converted video occupies on a DVD disc. Check your dvd video by clicking the folder which appeared after the download is complete. The program detects all types of quality available on YouTube for every video and you can select which one you would like to download. Just choose one from the drop-down list. In playlists you can choose available quality for each video or set Group format for the whole list. You can also select/unselect vidoes from the playlist, check the overall size of the videos and the estimated free space on your hard drive. These functions are active if you purchased Rocket Subscription. You can set the number of files as well as the number of file segments for parallel download and thus have higher download speed. Set video quality which you would like to get from YouTube. This parameter will be set as default for all videos unless you choose some other available quality for a particular video. You can also set options like "Autolaunch at Windows startup", "Add browser context menu integration" and some others. Moreover you can choose to save/clear download history. Set "Auto-paste URLs from Clipboard", "Automatic download" and some others as you wish. To use a proxy server, check the box and enter Address and Port. You can find information about proxy Address and Port in your browser settings. By default the output file name is the same as YouTube video title is. If you want to change it, change parameters: Name Prefix, Postfix and others. In the bottom of this section you can see the pattern of the output file name. It is formed according to the current options and it is the same for all output files during one session.